Involving youth in performance and creative expression is one way the African Canadian community in Saskatchewan is building its cultural voice in the province and leaving a legacy. To bring different cultural communities together and to celebrate Canada’s 150, the Saskatchewan African Canadian Heritage Museum (SACHM), along with its partners from the City of Regina, University of Regina, African Canadian Resource Network (ACRN) and Ugandan Canadian Association of Saskatchewan (UCAS), worked to create a Cultural Village where different cultures would come together and youth could share, learn and perform traditional and contemporary dramatics, music and dance. 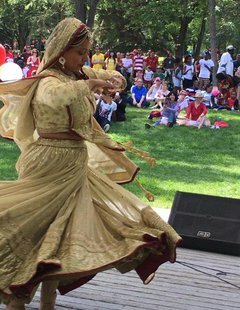 Workshops were help leading up to the Cultural Village, which was held in Wascana Park as part of Canada Day celebrations on July 1, 2017. Various youth, from mainly African backgrounds, attended workshops leading up to Canada Day event, where they learned how to develop and perform in a dramatic play. During the Cultural Village, various performances were held, featuring performers representing many different African cultures, including Somalian, Nigerian, Burundian, South Sudanese, Ugandan, Congolese, and Ghanaian, as well as those representing other cultures, such as East Asian, German, Chinese, and First Nations. Organizers had hoped this event was an opportunity for youth to gain knowledge and awareness about the contributions of African ancestry in the province, as well as build intercultural understanding. SACHM has been instrumental in preserving and promoting the history, heritage and contributions of people of African ancestry in Saskatchewan. Activities such as the Cultural Village and the publication of a children’s book called Li'l Shad by Miriam Korner and Alix Lwanga, help share and celebrate the history of African Canadians in the province, which dates back over 100 years. This project received funding support from SaskCulture's Mulitcultural Initiatives Fund.